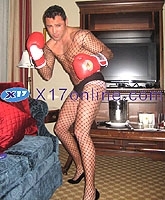 NOVEMBER 15--A New York stripper who recently sold photographs purporting to show Oscar De La Hoya dressed in drag, today sued the boxer for, among other things, defaming her by claming that the images were fake, a Photoshopped creation of the adult entertainer. In a New York State Supreme Court lawsuit, 22-year-old Milana Dravnel says that the images are authentic and were taken last May at the Ritz-Carlton hotel in Philadelphia (Dravnel contends that she engaged in a 16-month "intimate relationship" with the married De La Hoya). An excerpt from Dravnel's complaint can be found here. Dravnel alleges that after she sold the pictures to the X-17 photo agency (and did an "Entertainment Tonight" interview about the images), she met with a De La Hoya representative and was later "forced to recant" her prior press statements. She also claims that De La Hoya's camp got her to sign a "one-sided" legal agreement that barred her from further sales of the images, which appear to show De La Hoya, 34, wearing women's underwear, a wig, heels, and a fishnet bodysuit. In one image, the man pictured is wearing a pair of Everlast boxing gloves. The September 23 legal agreement, the lawsuit reports, was signed on De La Hoya's behalf by "authorized representative" Stephen Espinoza, who has previously been identified as an attorney for the athlete. Dravnel, who says she received "no consideration" for signing the legal agreement, charges that she was coerced into signing the document as part of De La Hoya's "effort to stonewall" any additional sale of "pictures taken by her from her own camera."